God spoke all these words: I am the Lord your God who brought you out of Egypt, out of the land of slavery.01 You shall have no other Gods before me. 02 You shall not make for yourself an idol. 03 You shall not misuse the name of the Lord your God. 04 Remember the Sabbath Day by keeping it holy. 05 Honor your father and your mother. 06 You shall not murder. 07 You shall not commit adultery. 08 You shall not steal. 09 You shall not give false testimony. 10 You shall not covet. 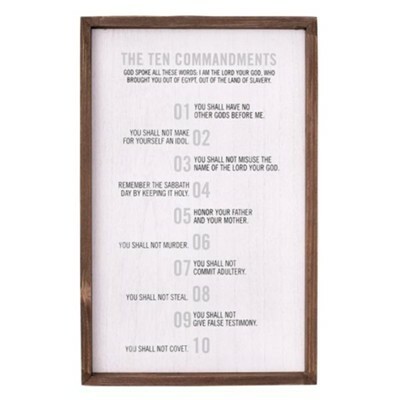 I'm the author/artist and I want to review 10 Commandments Wall Plaque.